She’s a tomboy with fiery hair and attitude to match. She’s also skilled archer determined to change the status quo in a land bound by custom. She’s Merida—a Disney Princess who doesn’t want to be a Disney Princess. This is problematic for the Scottish teen, who was (unlike a closeted stepdaughter or the bookworm offspring of an eccentric inventor father) born into the role. Merida's mother is eager to marry her off to the first worthy suitor, but this girl just wants to have fun. Kelly MacDonald (HBO’s BOARDWALK EMPIRE) voices the heroine of BRAVE, the latest feel-good computer cartoon from Pixar. Merida is the only daughter of King Fergus (Billy Connally) and Queen Elinor (Emma Thompson), whose kingdom is one of four thriving in the ancient Highlands. The patriarchs of the neighboring tribes have accepted Fergus’ invitation to bring their sons into town to compete for Merida’s hand, unawares that the redheaded wants nothing to do with the pomp and pageantry orchestrated by her overbearing mother. Merida subverts an archery competition by entering the games herself in a bid for freedom from marriage. She wins handily, precipitating a nasty row with the disappointed queen. Merida flees into the forest, where a trail of vaporous blue Will O’ the Wisps lead her to a Witch masquerading as a woodcarver. We’ve been here before, so we know what’s coming next. Merida’s wish for her mother to change is granted, but the transformation isn’t quite what she had in mind. Elinor morphs into a bear, which is particularly inconvenient given that her “Bear King” husband is renowned for hunting ursine. Merida confesses to Mama Bear, but the two are flushed from the castle by Fergus and his guests, who mistake Elinor for a bloodthirsty bear of local legend. Movie curses need countdowns, of course (see SHREK, CINDERELLA, etc.). Accordingly, mother and daughter have two days to bond in the wild and “mend the fabric” that unites them before Queen Elinor’s new shape becomes permanent. The deadline becomes crucial in a film that boasts no conventional villains per se. Sound familiar? Of course it does. Disney pawed this path ten years ago with BROTHER BEAR, wherein an impetuous teenage Inuit learns valuable life lessons after turning into a grizzly. One supposes BRAVE could’ve been titled MOTHER BEAR. Fortunately, the TOY STORY studio is gifted enough to make something old feel new. Brad Bird protégé Mark Andrews (INCREDIBLES) lovingly adapts a story by Brenda Chapman (PRINCE OF EGYPT), using technical assistance from veteran graphic designer Steve Purcell. The pace is brisk, the gags frequent, and the visuals sublime. Animators have reached the point, it would seem, where accurately rendering once-tricky textures like hair, feathers, and fur is not only possible, but par for course. Merida’s locks look like tangled yarn. Her dresses have an authentic sheen. The animals—from horse Angus and family dog to the picture’s many bears (including a trio of cubs) are convincingly colored. The landscapes are lush, airy, and brilliant. Scenes with water are especially stunning, like when Merida stretches her hand into a waterfall and goes salmon fishing with her decidedly non-outdoorsy mum in a babbling brook. And when Merida pulls off the ROBIN HOOD stunt of planting an arrow through an opponent’s bulls-eye, the slow-motion warble of the shaft in flight and splintering of wood on target is, well…pretty cool. Composer Patrick Doyle (DONNIE BRASCO, THOR, HARRY POTTER) keeps things bouncing along perkily (like Merida’s hair) with a score inspired by traditional Celtic instrumentation. Flutes, harps, and dulcimer weave intricate melodies over bodhran-beaten rhythms that capture—mimic, even—onscreen activity like the plodding of horses through a forest or the havoc caused by giant, embattled bears. MacDonald is spot-on as the emotionally torn lassie out to repair family ties while asserting her own identity. But comedian Connally practically steals the show as her thick-brogued, henpecked, peg-legged father. Peripheral characters—like Merida’s suitors and their goofy dads—also provide big laughs. Too bad Sean Connery's retired; the ex-007 actor would've been perfect for one of these kilt-wearing McClouds. 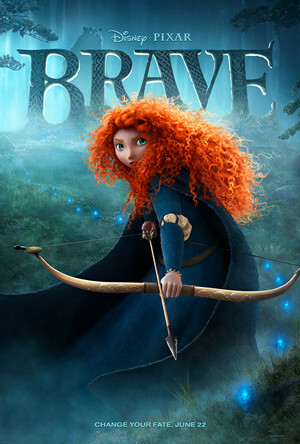 BRAVE is a rousing ride that emphasizes the importance of family while stressing the merits of individuality. Teenagers of every culture clash with parents over what they should do with their lives, measuring those options against what they actually want to do with their future. BRAVE unfurls this rite of passage like a tapestry, demonstrating that it is possible for a headstrong young person to be all that she can be, actualizing her potential while maintaining healthy relations with the ‘rents. So while BRAVE warrants a “C” for originality, it earns an “A” in execution—and another feather in Pixar’s already-flamboyant peacockian cap. 3 out of 4 stars.